If you read my blog, you will know that last year I moved to Windows 10 after 8 years happily using a Mac Mini and a Macbook. I did it mostly because of the low battery life of my Macbook (around 2 hours) and because of that news saying Windows now had a real linux prompt. More on that here. It have been 5 months trying to get Windows (Lenovo T470P) to fit my needs and after that, another 2 months using Ubuntu until I finally realized the only solution was going back to Mac. Windows 10 lag: from time to time I get some small freezes that ruin my concentration. External monitor management: when I connect an external monitor, many windows mantain the double size of the laptop screen, this is really annoying. Ubuntu shell: it’s broken, there are two sepparate filesystems and it’s not possible to access to the same file from windows and from ubuntu shell without breaking anything. Forced to reset every day: With mac I can close the lid at night and open it at next morning and continue working in 5 secs, this is impossible with my Lenovo, you must reset to get things working normally. And the worst of all is that actually most of these things work perfect on Mac. My Macbook has never been the best on battery life as it’s the first Retina model from Mid-2012, but last years things had been going worse until the actual around 2 hours of battery life. That’s definitely not enough for me, I work a lot outdoors and I need a decent amount of time without plugging in. My Lenovo T470P is really good about it with more than 5 hours of battery life, but as I told you Lenovo was no longer a valid solution, so I wanted to try a battery upgrade for myself before assuming I needed to save a lot of money to buy a new Macbook. After some search I found that the famous “Ifixit” had a fix kit (new battery and the needed tools) for 89.95€, it was a good price for me so I ordered one but with little hope I must say, as upgrade it’s a complicated process as the battery is glued and because I didn’t think this would be much improvement on the battery life. I ordered it a sunday paying the lowest delivery rate and the fix kit was here on friday. I chose to ignore “Ifixit” 52 steps instructions and used a thread to remove the glued battery without pushing out anything apart of the battery… and it was the right decision! Battery was out on a mere 10 minutes! I only needed a total of 15 minutes and my old macbook was starting up with its brand new battery, and it was a big surprise, the battery life is bigger than original! 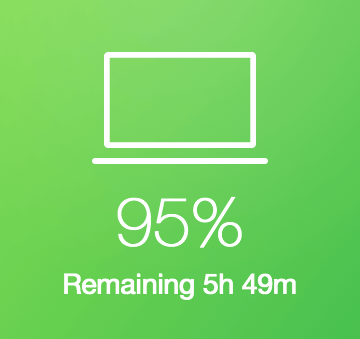 now I have more than 5 hours of battery life, that’s incredible for my 2012 MacBook!